A stunning new range brought to you by Emotion and Kids, featuring embroidered animal sets. 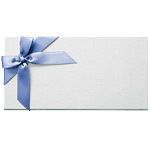 This pale blue theme is a popular selling range as the colours complement each other well. This blue safari outfit is an everyday essential item that has been one of our bestselling products. With attention to detail and quality materials that are synonymous with the brand Emotion & Kids. Made from 100% soft cotton and designed in Australia. This gorgeous blue safari outfit is an everyday essential gift item. With quality and care taken at every step this bodysuit is built to last even the toughest little critters! Designed in Australia and made from 100% soft cotton. 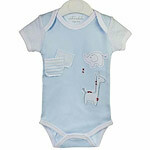 This blue safari bodysuit is an everyday essential and makes the perfect contribution to any little boys nursery. The lovely safari theme across the romper is sure to compliment other gift items in this range. This soft and stretchy 100% cotton wrap is made in an extra large 120 x 120 cm size which is perfect for swaddling your baby. Made in Australia and our most popular and useful wrap. Ideal for your baby's first wrap and a must to pack in your hospital bag. Perfect for protecting your baby's clothes from spills and dribble. Made from 100% cotton excluding detail. 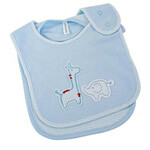 The set includes one bib with our popular safari design, the other striped.